1. Chop the tomatoes into small pieces, Slice the dates and ginger into thin juliennes. 2. Add chopped tomatoes to the pan. Add ½ cup water and cover and cook for 15 mins. Stirring from time to time. 3. Add the sliced dates ,ginger and raisins to the tomato and cook for another 5 mins, till all the water dries up. 4. Add sugar and cook for 5 mins. The chutney should have a jam like consistency and should not stick to the pan. 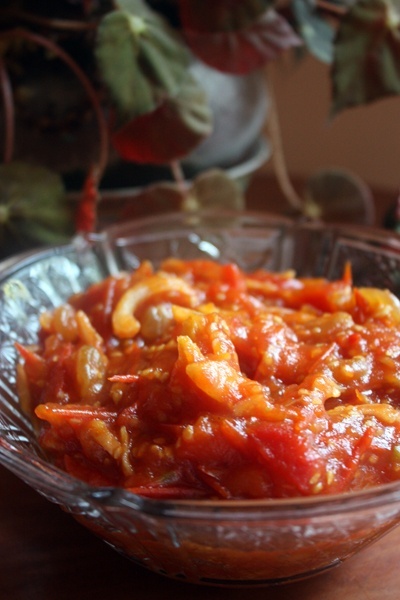 This entry was posted in Grand Ma's Recipes, Pickles & Chutneys, Vegetables and tagged Tomato by Kamakshi. Bookmark the permalink.